Being high up (1350 - 3250 m), this is a reliable place for snow from November to May even away from the Rettenbach and Tiefenbach glaciers. Conditions have varied from good to excellent on past trips. 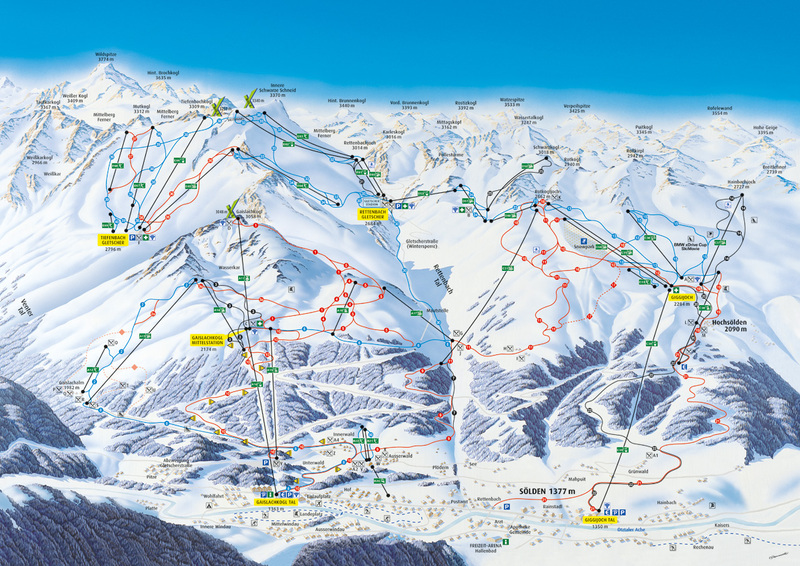 Sölden features up to 148 km of pistes suitable for people of all ability ranges with modern lifts (69 km blue, 51 km red and 28 km black). Ski and snowboard lessons can be arranged to get you started or refreshed at the beginning of the season. We are staying for the third time in the Tiroler Adler ****, with excellent rooms and sauna facilities. It is located not far from Sölden and its shops, clubs and bars. The main lift Giggijochbahn is walking distance away and we can also get to and from the glacier by bus. http://www.tiroleradler.net. Dinner on Saturday evening is in a nearby restaurant in traditional Austrian style.